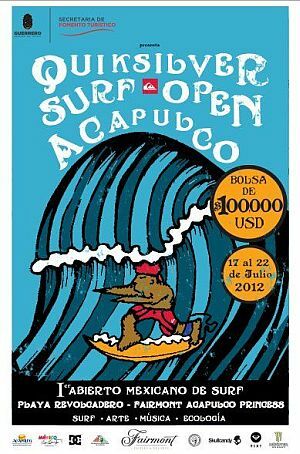 With $100,000 USD in prize money, the Quiksilver Surf Open Acapulco, supported by the Guerrero Surfing Association and Mexican Surfing Federation, is the richest Open surfing event in Mexico. Hunnington Beach, California - A last-minute addition was added to the ASP North America schedule on June 26, with the ASP 4-Star Quiksilver Surf Open Acapulco officially confirmed to take place at Playa Revolcadero from July 17 through 22, 2012. While events are not typically added to the ASP schedule on such short notice, the opportunity to add a new event in the Latin region could not be passed up. With the elimination of events in Puerto Escondido and Mazatlan this year, the Quiksilver Surf Open Acapulco offers a great opportunity for emerging Latin American and US surfers to build their ASP World Ranking. "Having the Quiksilver Surf Open Acapulco as a 4-Star event will give Latin American surfers the opportunity to further their presence on a global scale without having to travel to distant countries or continents to earn points," Brian Robbins, ASP North America Tour Manager said. "We feel Mexico is an important part of our region and are happy we could continue to work with Quiksilver Mexico again this year." In addition to the benefits of having an event in Mexico, the Quiksilver Surf Open Acapulco’s ASP 4-Star status allows budding talent the chance to showcase their abilities while building their careers. "With our current schedule hosting several ASP Prime and 6-Star events, the Quiksilver Surf Open is just as important in establishing a path for the next generation," Robbins said. "Providing these events as a pathway for up-and-coming surfers is a crucial job for our region and the Mexican event is a great addition to the schedule." The Quiksilver Surf Open Acapulco will be the second of two Latin American events this year and will follow shortly after the ASP 3-Star Copa Quiksilver El Salvador and spots are available for entry. For additional ASP information, visit aspworldtour.com or aspnorthamerica.org.